I like to decorate. I can see the finished job before the project is completed. I designed a window treatment project for my cottage style living room. I placed 21" x 98" boards over the two 8' glass sliding doors that open out onto a covered porch. Crown molding that matches my existing crown molding was attached to the top of the board. I glued a spray of resin roses (6" x 14") to the middle of each board and then painted the board white to match the window facings. Next, I put up 4.5" dual rods above each door, attaching them to the bottom of the board below the roses. Lastly, I hung the floor length white sheers and the dark teal valances. I pulled the sheers to each side and tied them back with teal rosettes. I was very pleased with the soft look. 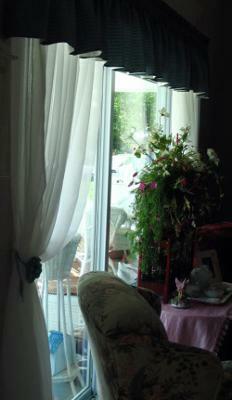 I didn't mention that I also placed rose headers above the other living room doors. What a super idea Julia. Thank you so much for sending it in and especially for the lovely photos.